Today’s high-end kitchens aren’t just beautiful by design, they’re also efficient in their use. While not the norm, chef’s kitchens blend form and function for the at-home cook. There are two types of homeowners when it comes to remodeling today’s kitchens: those who cook and those who don’t. While some prefer to have their kitchen be an Instagram-worthy room free of clutter and perfect for entertaining, others want a gourmet, or chef’s, kitchen that is designed with cooking in mind. Gourmet kitchens aren’t the norm: The 2018 U.S. Houzz Kitchen and Trends Study found cooking from scratch ranked only fourth in homeowner interests. But if your clients like to cook, you have a potentially big project on your hands. The first step to creating that gourmet kitchen will be to find room for a sink area, range center, and refrigerator zone. Although the National Kitchen + Bath Association (NKBA) found in its 2018 design trend report that the three trendiest kitchen sink styles are undermount (92%), single-bowl (81%), and farmhouse (81%), there is another style perfect for gourmet kitchens: a workstation sink. Also known as a prep sink, it’s a longer undermount sink, sometimes with dual faucets, that incorporates areas on the sides for cutting boards, straining, racks, and other accessories. A powerful dishwasher should also be present in the sink area. In certain cases, gourmet kitchens may have dual dishwashers, used for different purposes. “Dishwasher third racks have also become popular in recent years, as consumers crave an easier way to load small items like ramekins, spatulas, and whisks,” says Anja Prescher, director of brand marketing at Bosch Home Appliances. 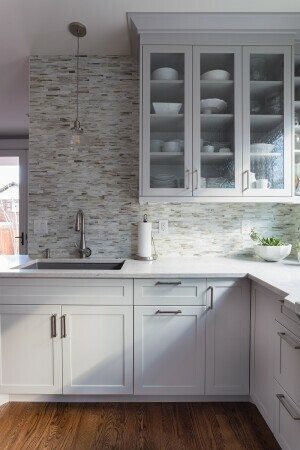 Gas ranges with four to eight burners and a griddle are typical in a chef’s kitchen, but Paula Kennedy, certified master kitchen and bath designer and owner of Seattle-based Timeless Kitchen Design, joins with McMahon in saying induction cooktops are becoming more popular. For a more professional look, designers will dress up the ventilation hood above. In a small kitchen, you’ll have to be creative. To add more counter space, Kennedy designed a roll-out counter within a nearby cabinet and topped it with a butcher block with a pull. Other appliances, such as ovens, warming drawers, built-in microwaves and coffee machines, will also live in the range center, but the appliance package will differ based on each client. Homeowners may opt to have a higher-end fridge with an air purification system and vacuum-seal door to help preserve the quality of freshness. Silver stainless steel remains supreme in finishes, but appliance manufacturers are debuting black and matte-black stainless. Glass door fridges are also an option, to provide visibility into the appliance. Homeowners may choose to integrate or overlay the fridge to streamline the overall look of the kitchen. 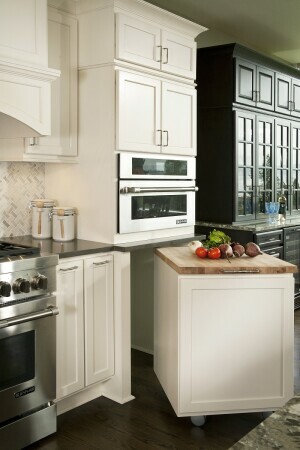 Another common appliance in gourmet kitchens is a beverage or wine cooler. These can vary from refrigerator-height to smaller under-counter installations. Manufacturers will continue to innovate with refrigeration and other appliances. Many have already released smart appliances that connect with the home’s wireless internet, but homeowners haven’t caught on just yet. Our informational magazine is designed to keep you updated about the latest and greatest trends in architecture, design, style, landscaping and, well, just about anything you can add to or build around your home. Keep checking back with us!